The number of teenagers dropping out in high school is a social problem that is often not talked about or researched enough. A great, working teacher-student relationship is vital for student success in the educational system. This research study looks at some of the different variables that influence teenagers to drop out of high school, focusing on the question of whether or not teachers have an impact on the decision. The purpose is to raise awareness about the qualities of high school students who typically drop out, so that those statistics may decrease in the future. Research has shown high school dropouts to be lacking more economically and socially than those who have completed full K-12 education. A high school dropout earns less money, is more likely to be in jail, is less healthy, and is less likely to be married. To sum it up, a high school dropout has an overall lower quality of life than a high school graduate (Messacar & Oreopoulos, 2013). Some believe that still being able to earn a GED makes dropping out of school better. Today's society does not put enough focus on the negative consequences that come along with a student's decision to drop out of high school (Hickman, Bartholomew, Mathwig, & Heinrich, 2008). In 2012, an article by Zajacova, researching 25 different health problems, found that those who complete their high school education had significantly better health than dropouts. The study also showed no significant health increase between a dropout and a person that received a GED. The lower overall health is due to lack of seeking health-care, insignificant healthcare coverage, unaffordable vaccinations, and an inability to afford healthy food (Zajacova, 2012). Violence plays a key role in deciding whether or not a child will graduate from high school. Bullying is a form of violence often found within the school, whereas gang and peer-related violence can be found outside of the school environment. A national survey indicated that approximately 28 percent of United States adolescents reported bullying occurred at their schools during the past school year (Cornell, Gregory, Huang, & Fan, 2013). Bullying can be a form of peer aggression where a power imbalance exists between the aggressor and the victim. With new technological advancements, cyber-bullying has been invented. A study published by the Journal of Educational Psychology showed a significant correlation between bullying and academic performance, which in turn can be related to dropping out (Cornell, Gregory, Huang, & Fan, 2013). Bullying can be found in every high school, but inner-city schools often experience a different form of violence. Inner-city violence is directly related to peer-status. Studies have shown that popular students often receive better grades than unpopular students. People are influenced by their friends and the people they spend most of their time with (Ehrenreich, Reeves, Corley & Orpinas, 2012). Unpopular students often resort to violence to gain some form of respect among their peers. This is very prevalent in underprivileged teenage boys. "School failure and frustration motivate lower-class boys to join oppositional subcultures that embrace and reward violence and aggression" (Staff & Kreage, 2008). This violent subculture often leads to further punishment in the form of a fine or juvenile arrest. Whenever students go to a juvenile detention center or correctional facility, they are pulled away from school and their peers, which stigmatizes them and causes a severe disadvantage in their educational careers. While incarcerated, the quality of education they receive is severely lower, which leads to students getting behind in their classwork upon returning to public school. Because of the helplessness and frustration caused by being behind, the probability of the student dropping out in the future increases. Incarceration in a juvenile detention center has also been shown to lower the chances of that student applying and/or getting accepted to a higher education institution. A disruption in students' educational trajectories rather than social-psychological factors can be responsible for the correlation between arrest and education (Kirk & Sampson, 2013). Disrupting a student's educational trajectory such as today's juvenile punishment makes it more likely to be disconnected when returned to a normal education. As a result, the social disconnect created from "correctional facilities" increases the likelihood the student will dropout in the future. Another reason the high school dropout rate doesn't catch the public eye is because many people consider high school students dropping out as a choice rather than a social problem. We often put the blame on the individual, when really the school system should be looked at to find behavioral patterns in children's lives (Hale, Bartholomew, Mathwig & Heinrich, 2008). A child experiences the most change between ages 6-10 and 11-14. These periods in students lives often dictate how interested they are in school until they graduate due to environment and parent engagement (Englund, Egeland, & Collins, 2008). An early sign of a future dropout is disengagement and the inability to fit in. Teachers, mentors, and parents should all be aware of how important their role is to a child during adolescence (Schoeneberger, 2012). It is extremely important for teachers and other adults to look for negative indicators and report them to the guidance counselor. Simple measures like this could have a significant impact on the high school dropout rate (McCallumore & Sparapani, 2010; Strum & Boster, 2007). The final factor that has a major impact on the likelihood a high school student will dropout is poverty. Families living in poverty often have a hard time gathering the basic needs to survive (Tas, Bora, Selvitopu, & Demirkaya, 2013). Students coming from impoverished families are often disengaged at school due to the problems waiting for them at home. Education becomes less important to those whose basic needs are not being met. Parents of poverty stricken families aren't uninterested in their children. Instead they are busy working more than one job to provide for their families. High school dropouts are also more likely to live in poverty. They live month to month financially and often rely on government aid for food and other necessities. Student dropout rates have not changed over the past three decades. Society has failed to adequately address this corrosive social problem. Individuals that have chosen or will choose to drop out of high school are more likely to struggle with various other social problems such as unemployment, violence, and an overall lower quality of life. Students who make the decision to dropout are often unaware of the consequences their decision has on their overall quality of life in the future. We believe further studies are needed to pinpoint the exact age at which students are most likely to turn towards dropping out of high school. Adult intervention in the form of a mentor or counselor may lower the risk of students dropping out. The problem with our current system is that these adults have not been trained to detect early signs of a high school dropout. Middle school and the freshman year of high school are the ages at which adults have the most influence. Our study will focus on middle school teachers to see whether or not they have been involved in any type of training to detect the signals correlated with high school dropouts. We hypothesize that teachers are unaware of how to reach out to students who are on the verge of dropping out. Participants were currently employed by public schools in the same suburban county in northeast Indiana (Huntington County). 75 public school teachers were selected to reflect on the experience of a majority of the students attending each school. All were the head instructors of his/her own classrooms, teaching grades six through eight. There were 28 respondents, 4 coming from one school, and 24 from the other. An 18-question survey was created by the researchers through Survey Monkey (Appendix A). The majority of the questions were measured on a Likert Scale, with answer possibilities ranging from strongly disagree to strongly agree. In addition, each question was accompanied by a comment box so that participants could elaborate on their answers. Sample questions included things such as: "Do you see dropout rates as a problem in your school? ", "I have the ability to influence a student's decision to drop out or to stay in school. ", "I feel that changes need to be made in the school system to better serve students' needs. ", and "There are safe places and activities for me to connect with students outside of the classroom." To begin, the researchers emailed the principals at each middle school to gain permission to distribute the surveys. The email included brief information about the researchers the survey and the reasons for the researchers' interest in the topic. The email also included an option to meet face-to-face with each principal if he so chose. One principal took the offer, and granted the researchers permission after that meeting. The other principal was willing to distribute the survey without meeting. Once permission was given, the researchers emailed the survey to the principals, who then distributed it to their teachers via email. All data were analyzed through Survey Monkey. The site generated bar graphs for each individual question and provided the participants' comments below the corresponding questions. 13 teachers (about 46%) responded that they agreed with dropout rates being an issue in the Huntington County School System. Twenty-two out of the 28 responded that they either strongly agreed or agreed that they had an influence on their students' decision to either drop out or stay in school. One hundred percent of the respondents said that they either strongly agreed or agreed with the statement "I make a difference in my students' lives" and also were able to recognize when a student is struggling. The majority of participants agreed that out-of-the-classroom interactions with students are beneficial to student success, and that there are safe places to have these meetings. Based on the data recorded, it seems that most teachers would agree that changes need to be made within the school system as that was perceived to have more of an influence than teachers themselves. Based on the results from the survey, the original hypothesis seems to have been proven wrong. The teachers who responded to the survey considered themselves actively involved in their students' lives and academic careers and felt that although they have an influence, they are not the reason that students decide to drop out of school (Appendix B). It was interesting to see the results of the question that asked if teachers had an influence on this decision compared to the results of the question that asked the reasons or people who most influence teenagers to drop out of school. 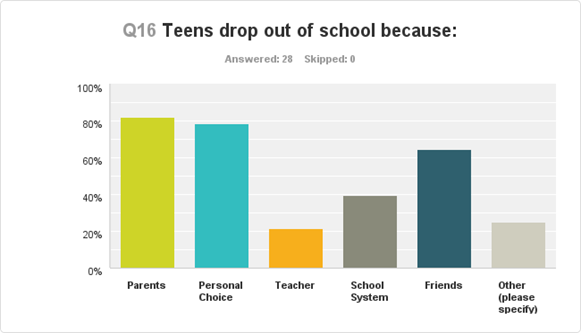 In the first question, 78 percent of the teachers said they strongly agreed or agreed that they had an influence on the decision to drop out or to stay in school. In the question regarding who had the most influence, only 21 percent (6 respondents) responded saying teachers had the most influence. It was interesting to see that when a similar question was worded in a positive way, the respondents gave themselves credit for it, but when it was worded with possibility of blame, the majority didn't want to put that on themselves. One respondent explained him or herself well in a comment: "If I can help students see that their future has greater opportunities by getting educated, they may be open to staying in school. The challenge is getting them to see beyond their current circumstances. We are often products of our family models and environments." When looking at the school system as a whole as having more of an impact on this growing issue, teachers seemed to agree with this possibility more than some of the other ideas that were brought up on the survey. No teachers strongly agreed when asked if students' needs are being met by the educational system, and more than one-third disagreed or strongly disagreed with this statement. Numerous teachers mentioned in the comment section that more efforts need to be made to get teaching back to the original goal of making sure students understand the material and feel valued, rather than teaching things quickly so that standardized test scores will be higher. Sixteen teachers agreed that changes should be made to the school system to better serve the needs of students, and the majority of the comments reflected the need for a true alternative school that could provide more one-on-one or small group help to get homework done. Huntington County has an alternative school set up for middle school and high school, but it is more for the students who have behavioral problems. Although these students are definitely considered high-risk for dropping out, the teachers who commented on the survey questions alluded to the need for an alternative school specifically to satisfy the needs of the students who truly are behind academically because of other environmental issues, rather than behavior issues, that could potentially distract other students in the alternative school. As with most research projects, there are several steps that could be carried out better in the future. For this survey, 75 teachers were selected to be participants, but only 28 responded. This is about a 37 percent response rate. In the future, research should be broadened to other school districts, maybe some that include inner-city schools and also varying sizes of schools to get a larger sample size. Another idea recommended for future research is to meet face-to-face with all school principals before distributing the surveys. The school principal who met with the researchers for this study had 24 of the 28 respondents complete the survey, while the other school whose principal had 4 respondents. The researchers believe that if they had met with the other school principal, more teachers would have responded to the survey. Hale, G. P., Bartholomew, M., Mathwig, J., & Heinrich, R. S. (2008). Differential developmental pathways of high school dropouts and graduates. Journal Of Educational Research, 102(1), 3-14. McCallumore, K. M., & Sparapani, E. F. (2010). The importance of the ninth grade on high school graduation rates and student success in high school. Education, 130(3), 447-456. Messacar, D., & Oreopoulos, P. (2013). Staying in school: A proposal for raising high-school graduation rates. Issues In Science & Technology, 29(2), 55-61. Staff, J., & Kreager, D. A. (2008). Too cool for school? Violence, peer status and high school dropout. Social Forces, 87(1), 445-471. Thank you for participating in this survey for the Huntington University Research Method's class. This survey is 16 questions and will take anywhere between 5-10 minutes. This survey will close on March 23, 2014. Students who drop out of high school often begin to show warning signs in the early stages of their education. The middle-school years are where bad habits and disconnect begin to develop. Students spend 8 hours a day, 180 days a year with teachers giving the teacher a great opportunity to have an impact on the lives of students. Previous studies have looked at problems with the system and other variables in the student's personal life, but the student-teacher relationship has been overlooked. We want to get an idea, from a teacher's perspective, about how troubled teens are viewed. 1. Do you see dropout rates as a problem in your school? 2. Do you feel you influence a student's decision to drop out or stay in school? 3. Do you feel you have a responsibility to mentor students? 4. Do you feel the needs of the students are being met by the current education system? 5. Do you feel changes need to be made in the school system in order to better serve students' needs? 6. Would you benefit from taking a class on how to reach out to struggling teens? 8. I am able to recognize when a student is struggling with peers, grades, home life, etc. 11. I find conversations outside of the classroom beneficial to the student-teacher relationship. 12. I notice similar characteristics in students that are more likely to drop out. 13. There are "SAFE" activities, places, etc. for me to connect with students outside of the classroom.